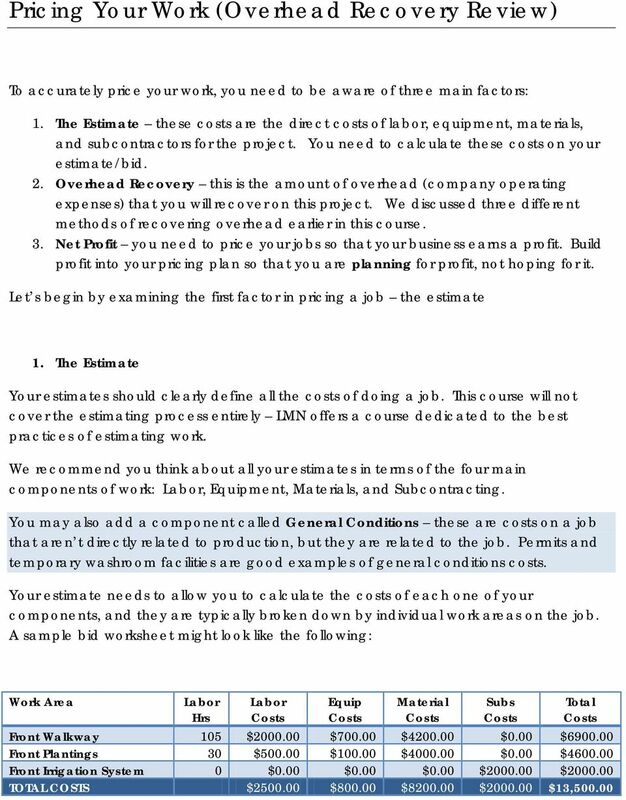 Download "Pricing Your Work (Overhead Recovery Review)"
3 Once you have built a proper estimate, where you have estimated all your production costs for the job, you can move on to step two, overhead recovery. 2. 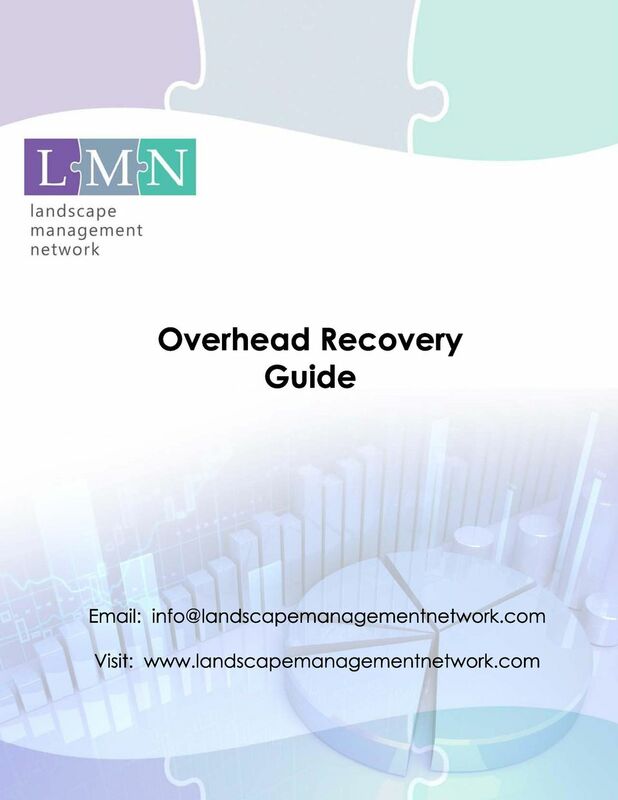 Overhead Recovery Once you ve calculating how much it s going to cost your company do to the work, you need to calculate how much of your company s overhead costs this job needs to recover. By actually calculating how much overhead each job needs to recover, your company will stand a much stronger chance of being a profitable company. 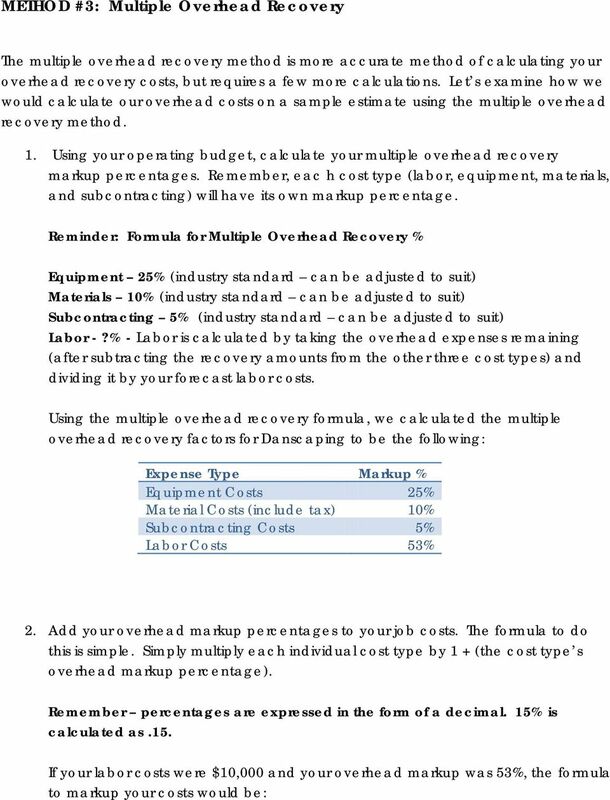 Using the three methods we covered earlier, single overhead recovery, field labor hours, and multiple overhead recovery, let s review how each method would add an overhead markup to our sample estimate. 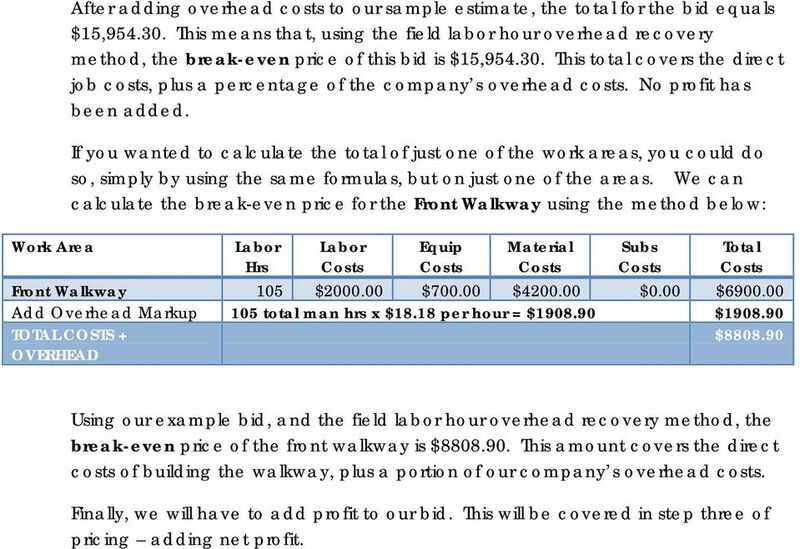 5 Add Overhead Markup 32% 32% 32% 32% TOTAL COSTS + $ $ $10, $ $17, OVERHEAD Work Area After adding overhead costs to our sample estimate, the total for the bid equals $17,820. This means that, using the single overhead recovery method, the breakeven price of this bid is $17,820. This total covers the direct job costs, plus a percentage of the company s overhead costs. No profit has been added. If you wanted to calculate the total of just one of the work areas, you could do so, simply by using the same formulas, but on just one of the areas. 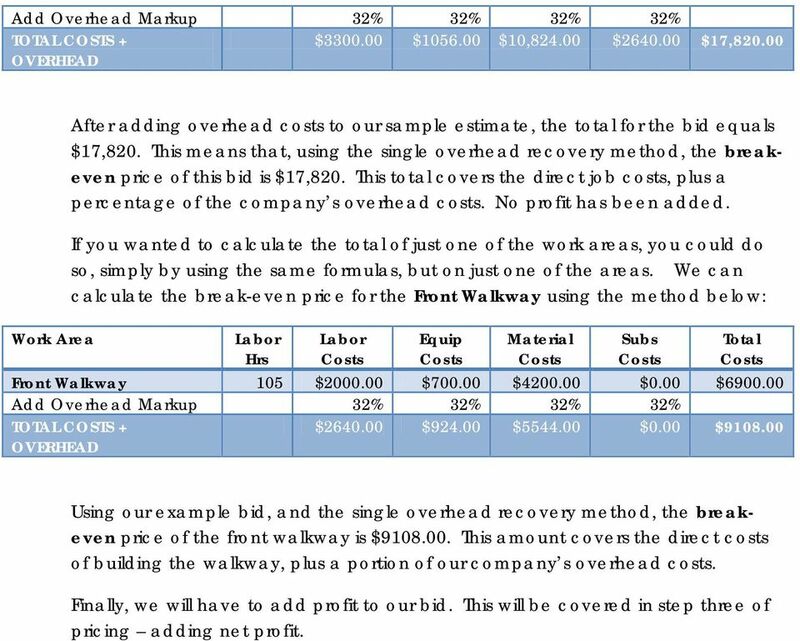 We can calculate the break-even price for the Front Walkway using the method below: Add Overhead Markup 32% 32% 32% 32% TOTAL COSTS + OVERHEAD $ $ $ $0.00 $ Using our example bid, and the single overhead recovery method, the breakeven price of the front walkway is $ This amount covers the direct costs of building the walkway, plus a portion of our company s overhead costs. Finally, we will have to add profit to our bid. This will be covered in step three of pricing adding net profit. 7 Work Area After adding overhead costs to our sample estimate, the total for the bid equals $15, This means that, using the field labor hour overhead recovery method, the break-even price of this bid is $15, This total covers the direct job costs, plus a percentage of the company s overhead costs. No profit has been added. If you wanted to calculate the total of just one of the work areas, you could do so, simply by using the same formulas, but on just one of the areas. We can calculate the break-even price for the Front Walkway using the method below: Add Overhead Markup 105 total man hrs x $18.18 per hour = $ $ TOTAL COSTS + OVERHEAD $ Using our example bid, and the field labor hour overhead recovery method, the break-even price of the front walkway is $ This amount covers the direct costs of building the walkway, plus a portion of our company s overhead costs. Finally, we will have to add profit to our bid. This will be covered in step three of pricing adding net profit. 9 $10,000 x 1.53 = $15,300. 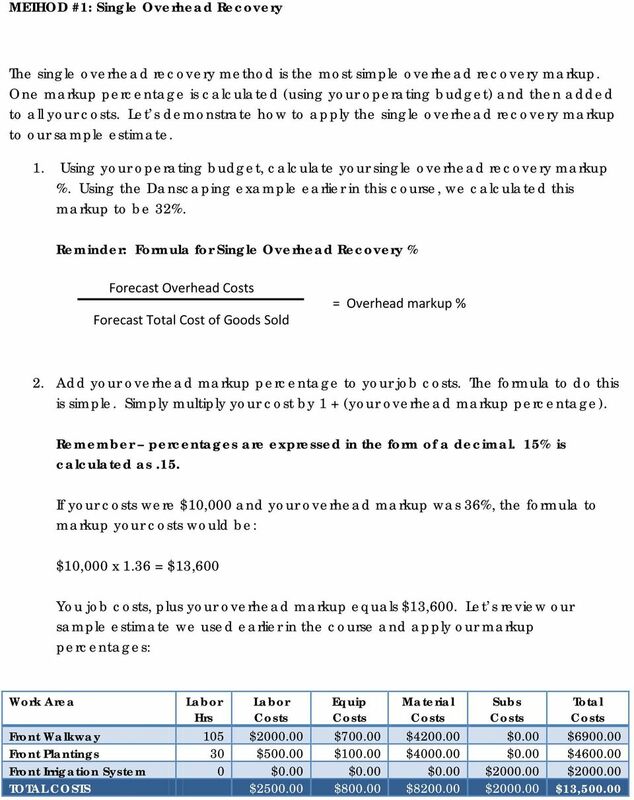 You labor costs, plus your overhead markup equals $15,300. 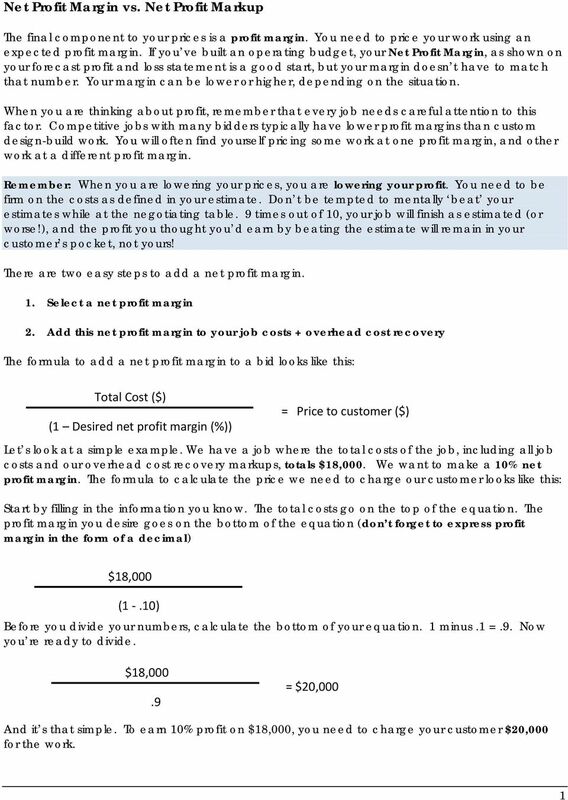 You then repeat the same calculation for your equipment, material and subcontracting costs using their unique markup percentages. 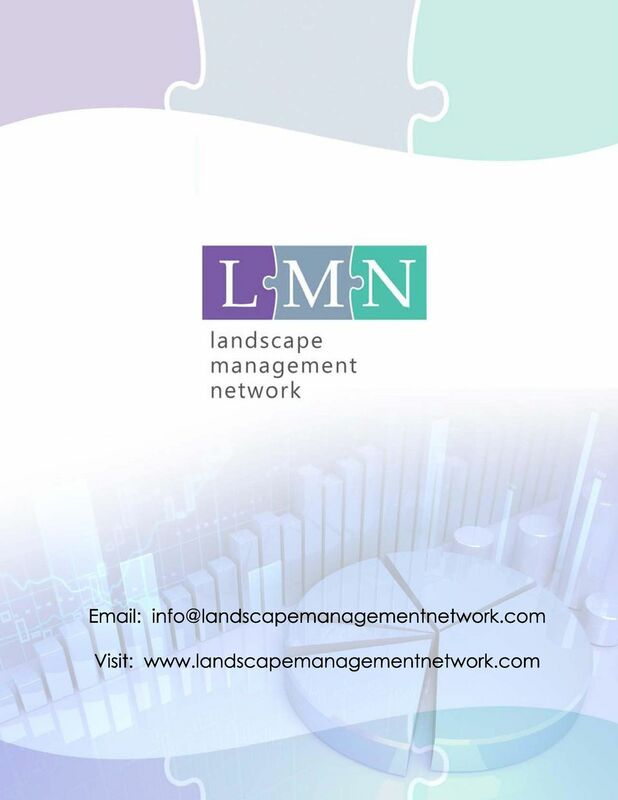 Let s review our sample estimate we used earlier in the course and apply our multiple overhead recovery markup percentages: Work Area Front Plantings 30 $ $ $ $0.00 $ Front Irrigation System 0 $0.00 $0.00 $0.00 $ $ TOTAL COSTS $ $ $ $ $13, Add Overhead Markup 53% 25% 10% 5% TOTAL COSTS + OVERHEAD $ $ $ $ $15, Work Area After adding overhead costs to our sample estimate, the total for the bid equals $15,945. This means that, using the multiple overhead recovery method, the break-even price of this bid is $15,945. This total covers the direct job costs, plus a percentage of the company s overhead costs. No profit has been added. If you wanted to calculate the total of just one of the work areas, you could do so, simply by using the same formulas, but on just one of the areas. 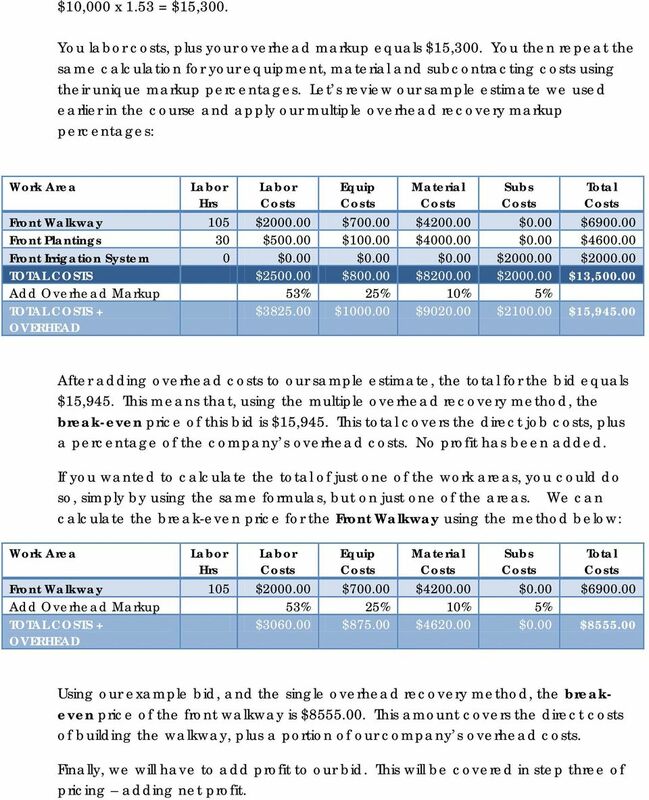 We can calculate the break-even price for the Front Walkway using the method below: Add Overhead Markup 53% 25% 10% 5% TOTAL COSTS + OVERHEAD $ $ $ $0.00 $ Using our example bid, and the single overhead recovery method, the breakeven price of the front walkway is $ This amount covers the direct costs of building the walkway, plus a portion of our company s overhead costs. Finally, we will have to add profit to our bid. This will be covered in step three of pricing adding net profit. 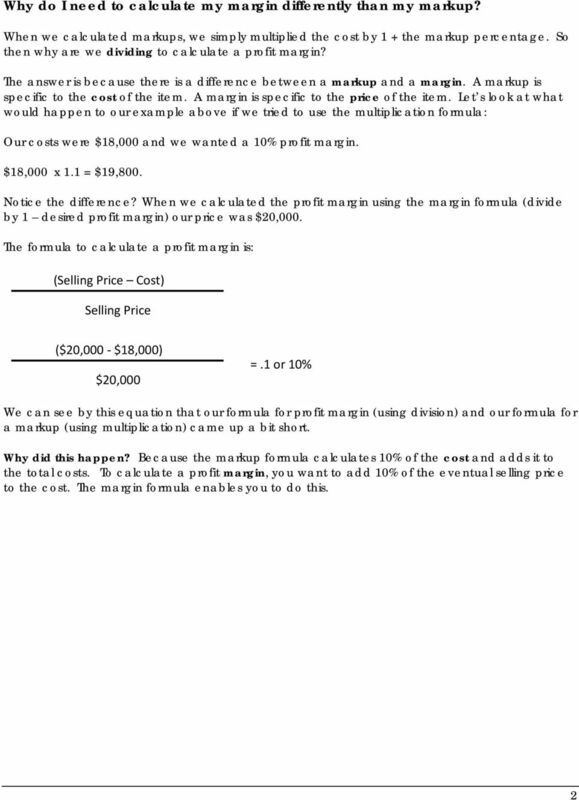 Breakeven Analysis. Breakeven for Services. Florida Child Support Worksheet and Guidelines Florida Statute (s. 61.30, F.S.) requires guidelines to be used in establishing new child support obligations or modifying child support in a Florida court. Coinsurance - Commercial Lines, Personal Lines, the Bottom Line Is It s a Problem!! Could a Managed Services Agreement Save Your Company Tens of Thousands of Dollars Each Year? The BASICS of CONSTRUCTION ACCOUNTING Workshop GLOSSARY From Financial Management & Accounting for the Construction Industry, CFMA. 2014 Matthew Bender and Company, Inc., a member of the LexisNexis Group. For illustrative purposes only, we will look at the logical flow of the Data Pro Job Cost package as a general contractor might use it. 7 Ways To Explode Your Profits as a Tint Professional and Change your Life Forever! DELMARVA SURETY FAX (410)561-3727 Surety Bond Specialists Date Submitted By BOND REQUEST FORM TO ENSURE TIMELY DELIVERY AND OUR ABILITY TO MAIL YOUR BOND, PLEASE SUBMIT YOUR BOND REQUESTS AS EARLY AS POSSIBLE. PG 1. 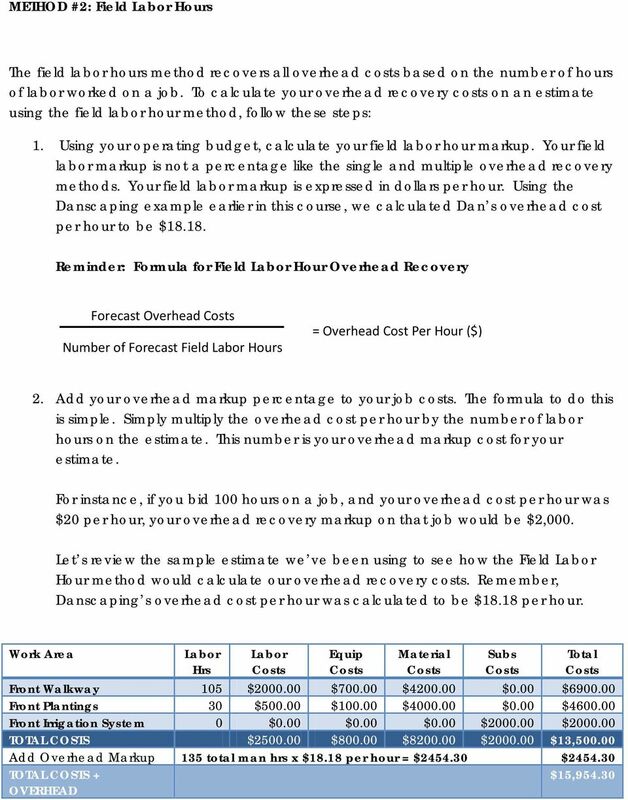 Collecting job costing data is simple if you set up your spreadsheet data properly.